It has been much talk lately about the opportunity posed by my courier for brands and businesses, and in fact, since the creation last year of the program Businesses on Messenger, which allows customers to shop online to receive their tickets or access customer service via chat, there have been many steps in that direction. However, Mark Zuckerberg always categorically denied the possibility of including results for this type of service and literally said – “I do not think ads are the right way to monetize messaging.” Now Techcrunch reports that have probably changed my mind. In addition, it had access to a document that Facebook sent some of the big advertisers where the company plans to include results reveal Messenger during the second quarter of this year. Specifically, it explains that companies may only send promotional consumers who have previously started a thread of conversation with them, messages and therefore encourages businesses to promote this means of communication with customers, so that they have more accounts that send them ads in the future. We do not known exactly how these promotional messages will, or what kind of formats can be executed. Since Facebook has refused to confirm the news Techcrunch and have simply stated: “We do not comment on rumors or speculation said, our goal with Messenger is to create a quality experience and generate engagement for the 800 million users that exist. And that includes assuring that they will not receive unwanted messages of any kind”. That does not mean, of course, that is not going to receive ads, but they will not be completely unwanted. Is good to know that at least marks cannot send these messages to anyone who uses Facebook or follow your page, but still be able to send a promotional message that is not a direct response to a question from the user, still seems potentially intrusive. In any case, we will have to wait a few months to see how it turns out this first attempt to monetize Facebook Messenger directly. Proof that advertising plans for Facebook Messenger already underway is the implementation of a short url, available for all pages under the fb.com/msg/ format plus the name of the page. Brands can now share and promote this link, which when clicked by a user takes you directly to a line of communication with the brand, either through the Messenger app or website. The commitment of social networks to become the new channel customer is clear, and therefore, through the Facebook chats Messenger- as Twitter – which yesterday launched new tools for this finally seems very interested in promoting this path communication. WhatsApp Will you go back? One month ago, WhatsApp announced that eliminated its annual rate, therefore, going to be free, many expressed their concern at the possibility that it was the gateway of advertising. Especially after Facebook CEO acknowledged that they were working on a model for business accounts -of which have not yet written a single line of code -. In any case, it explained that being tested tools that allow users to communicate with organizations from the platform, but stressing it would be a free service spam and advertising by third parties. However, many analysts believe that the model itself could include promotional messages, but within limits. 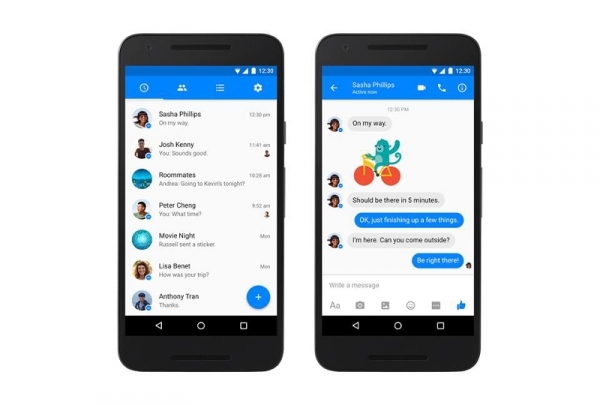 This movement in Facebook Messenger seems therefore make a trend we will see later reproduced in the other instant messaging application.